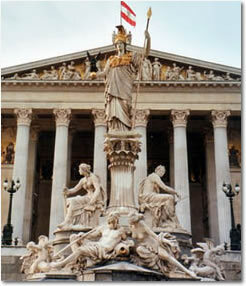 A true city of culture, Vienna is the music capital of the world. A guided walk follows a route that is star-studded in the true sense of the word for many stars have been inset into the pavement to mark the achievements of such luminaries of the music world as Mozart, Beethoven and many other composers, musicians and singers who have in the past been closely associated with the city. The Museumsquartier, with its baroque facade, is home to a major cultural district containing 3 opera houses, 50 theatres and 100 museums. After absorbing the culture that permeates the air in Vienna, why not stroll through the flea markets and the boutiques of the main shopping streets before pausing for a well-desrved break in one of Vienna's renowned, elegant coffee shops? Join the blue and gold carriages of the Venice-Simplon-Orient-Express in the beautiful city of Vienna for your overnight journey to London. Enjoy the delicious cuisine and relax as the towering Austrian Alps and Swiss Mountains pass you by. After departing Paris the next day travel to the French coast for the Channel crossing. Board the gleaming carriages of the British Pullman for your journey through the Kentish countryside to your destination, London Victoria. Join the blue and gold carriages of the Venice-Simplon-Orient-Express in the beautiful city of Vienna for your overnight journey to London. Enjoy the delicious cuisine and relax as the towering Austrian Alps and Swiss Mountains pass you by.